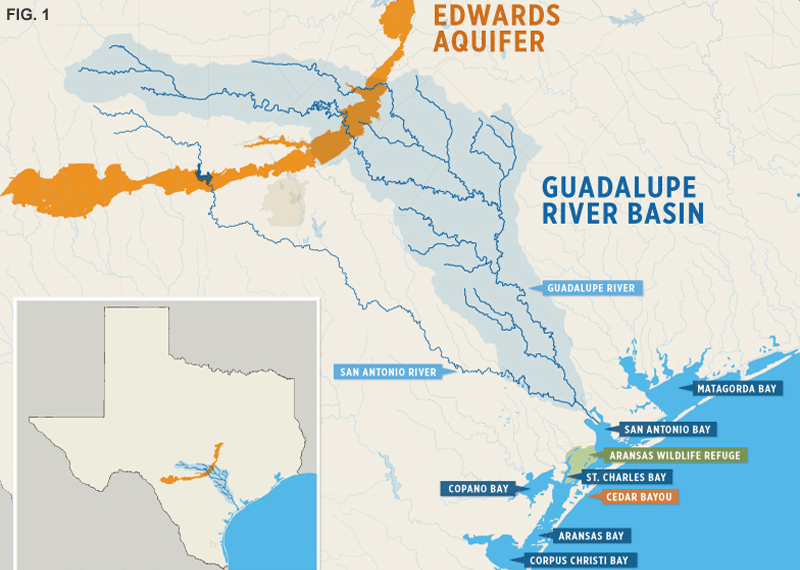 The Aransas Project, or TAP, a nonprofit that advocates for water conservation in the Guadalupe River Basin (see Figure 1), is filing a complaint in federal district court today charging that the Texas Commission on Environmental Quality’s management of the basin has caused an illegal “take” — harm or harassment — of the birds under the ESA. If TAP prevails, the court could force the state to restructure its system of allotting water permits and retract water rights already allocated to existing users. TAP has also asked the court to enjoin the TCEQ from issuing any new rights to users in the basin for the duration of the suit. The cranes winter on the Aransas National Wildlife Refuge, which occupies several miles along the Texas coastline where the erector-set-like outlines of refineries on the horizon are only barely visible, though the industrial tankers moving slowly through the waters serve as a constant reminder of their proximity. Each year, they attract thousands of tourists — some from as far as Europe and Asia — who book four- to five-hour-long boat outings to eagerly hoist their binoculars for glimpses of the birds, whose white plumage gleams brightly against the dull, brackish colors of the marsh. Last year, when a record-number of birds perished, the news captured international attention. In the 2008-9 winter, U.S. 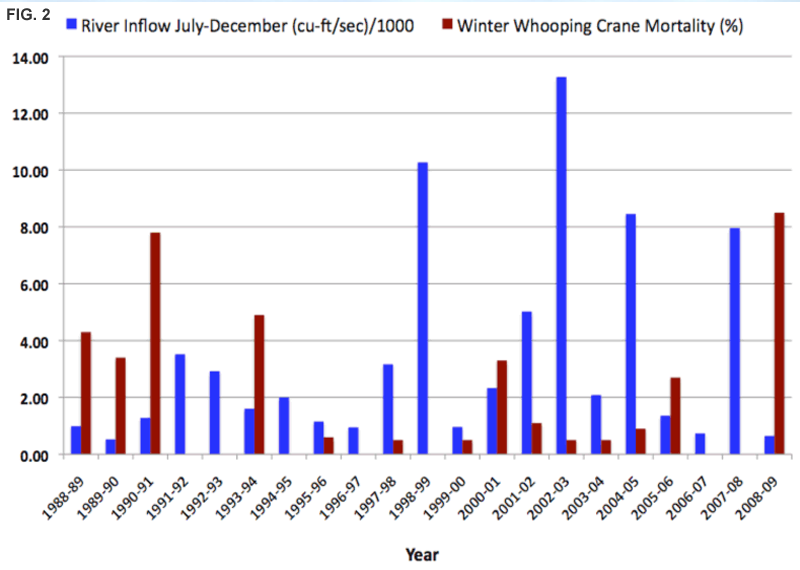 Fish and Wildlife found an eight percent mortality rate among the Aransas cranes, which make up the world’s last remaining naturally migrating flock; twenty-three birds died during a season where usually an average of only one is lost. According to U.S. 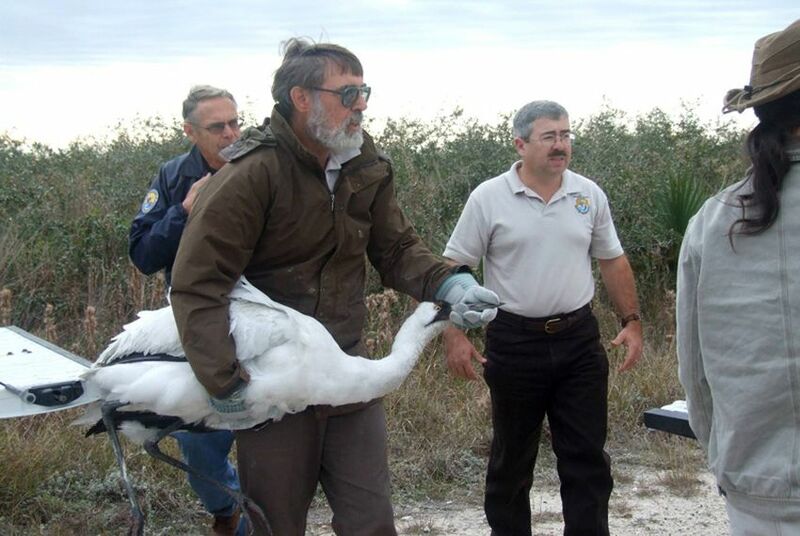 Fish and Wildlife official Tom Stehn, who has worked with cranes at the Aransas National Wildlife Refuge since 1982, the last year there was a comparable "die-off" was 1991, when eleven cranes were lost. TAP contends the crane fatalities are directly connected to the lack of fresh water flowing to the marshland from the Guadalupe and San Antonio Rivers, which are under the TCEQ’s authority — and data collected by TAP using state water models of fresh water inflow and mortality data from the U.S. Fish and Wildlife (Figure 2) show a strong correlation, at least. Stehn says he’s equally concerned with how high salinity levels effect the ecology of the marshland estuaries, which are a nursery for many ocean-dwelling species, like shrimp and red trout. The cranes gather on the refuge from November to April to gorge on native blue crabs and the Carolina wolfberry, a brilliant red fruit that resembles a cherry tomato, and fatten up for the 2,500-mile-long flight back to their spring and summer nesting-grounds in Canada. When drought disturbs the balance between salt and fresh water in the bay, the crabs and wolfberries don’t survive and the cranes starve, or become too weakened to endure the trek to Canada. Those familiar with the hue and cry of Texas water wars have long known an endangered species lawsuit on the cranes’ behalf was likely, according to veteran environmental lawyer Stuart Henry. “The water folks have known for a considerable length of time that this would be the last resort to protect freshwater inflows,” Henry says. The San Marcos River Foundation attempted to ensure that fresh water made it to the Aransas Bay as early as 2000, when it filed a permit with the TCEQ for unallocated surface water in the Guadalupe. The TCEQ denied the permit, saying state law did not allow the appropriation of water for instream flows. SMRF challenged the TCEQ in state district court, where a judge ruled in favor of the foundation. When the TCEQ appealed the decision in 2008, the higher court dismissed the suit, saying that the then recently-passed Senate Bill 3, introduced by state Sen. Kip Averitt, R-Waco, in 2007, banned the allocation of new instream water rights. Jim Blackburn, the attorney representing the Aransas Project, echoes Henry’s frustration. He says the group’s decision to sue came only after the group decided the Endangered Species Act was the only vehicle left to preserve the bay’s ecology. That’s particularly because of the limitations of Senate Bill 3, which while calling for a stricter permitting process for future rights, does not address existing users’ access to water. TAP thinks those grandfathered uses already strain the Lower Guadalupe Basin. The suit also comes after representatives from Aransas County and TAP traveled to the Texas Water Development Board’s Region L meeting in February, where they attempted to reshape the TWDB’s proposed 2011 water plan. Outen, the TAP regional director, said he realized at the meeting that “taking water out of the river, not leaving it in” was “institutionally baked into the process” of the TWDB. Part of TAP’s objection to the 2011 plan is the Guadalupe Blanco River Association's 75,000 acre-feet per year water reservation for a proposed nuclear power plant in Victoria along the Guadalupe River. (An acre-foot is the equivalent of about 325,000 gallons). TAP says the GBRA extended its agreement with Exelon, the nuclear company, under more favorable terms after TAP filed its notice of intent to sue the TCEQ in December. “We question whether it’s good public policy to locate one of the most water intensive industries in the world in a drought-prone area,” says Bill Jones, an agricultural representative on Region L who also works as a water policy consultant for the O’Connors, the six-generation South Texas ranching family that initially funded TAP. The Exelon contracts, which the Tribune acquired through an open records request, show the GBRA renewed the agreement through 2013 at a lower price, halving the initial charge and doing away with a monthly fee for the water in favor of a reduced yearly rate. Bruce Wasinger, the water authority’s general counsel, said it was "a total coincidence" that the new contract came after the notice of intent. The reason the price went down, he said, is because Exelon agreed to give the GBRA more flexibility in what to do with the water. But Charlie Smith, who says he’s “as fiscally and socially conservative as they come” and talks about the natural resources of the coastline in strictly utilitarian terms, supports the suit against the TCEQ because he believes the lack of fresh water in the bay threatens the region’s economic viability. A former Houston CPA who moved to Rockport in 2001, he is now an Aransas County Commissioner. The TAP suit parallels 1991 Sierra Club litigation filed against the U.S. Fish and Wildlife Service under the ESA to ensure enough water flowed from the Edwards Aquifer to protect a salamander living in the San Marcos and Comal springs, which the Edwards feeds. The judge ruled in favor of the Sierra Club, forcing the creation of the Edwards Aquifer Water Authority to maintain minimum inflows. That ruling, according to Kathleen White, a former TCEQ commissioner who is now a fellow at the Texas Public Policy Foundation, a conservative think-tank based in Austin, demonstrates the inflexibility the ESA demands from the court system.